I love visual things. I love photography, videography, style, pretty views, all kinds of patterns, illustrations, ad campaigns, architecture, jewelry, pretty gift wrapping, fashion editorials, art museums, interior design, the way food is presented on a plate, a really well merchandised shop floor, typography, well done web design, table settings, great magazine and book covers, gardens and party decorations. I've been wanting to learn how to deal with images and all these other things digitally so I've decided to teach myself how to use Photoshop. To get good practice, every month or so I'll post a mood board on the month in question. Et voilá! 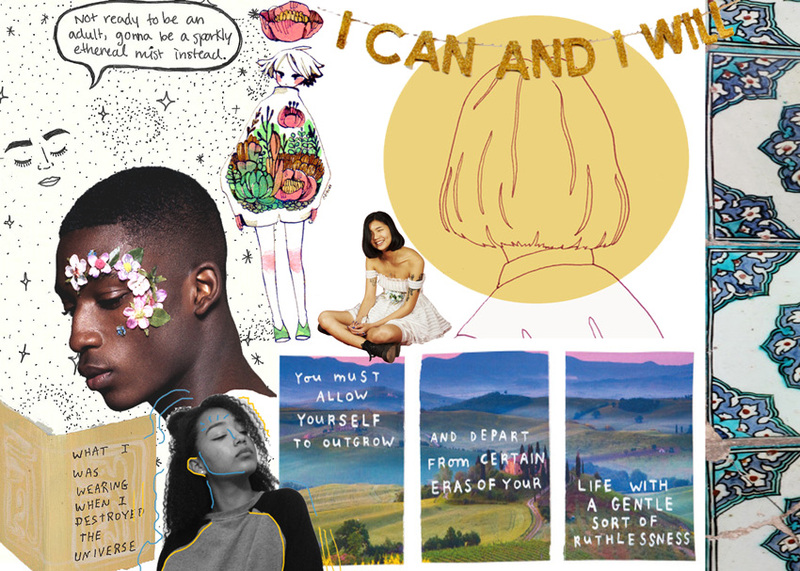 My first mood board of 2016; January! January is normally my least favourite of the 12 months. More than likely I'm broke from an indulgent Christmas season, I have to wait a whole year for it to be my birthday again and the weather is normally shite.com. But this year I've come to realize that you have a whole year to play with in front of you, there's goals to be accomplished and I've turned a new age which I always view as a new chapter to fill with adventures and other antics. And now that I'm living in Barcelona the weather in January is nothing but blue skies baybay! I've entitled the board Pretty Power. I don't know why but sometimes I feel guilty for being a girl who likes all of these visually stimulating things, like it's shallow in some way. But I've come to realize that I can like whatever the hell I want and still be taken seriously in anything that I wish to accomplish. So I'm ruling out that guilt and going for it in 2016. Here and here are the links to my Tumblr and weheartit profiles. Two websites that I literally spend hours trawling through and where you can find all the original images I used in the mood board. Here's to a great January!